Poison Refuses To Shun Cleveland!! Poison took to the Jacobs Pavilion at Nautica stage on Wednesday to an appreciative crowd of 3500. This show was added late into the mix on an off date during the Mötley Crüe/Poison/New York Dolls tour. Strange that The Crüe would skip a big market like Cleveland, but Poison did not let their faithful down. As a bonus Poison brought a rejuvenated Warrant as the special guest opener. As Poison hit the scenic stage at Nautica, it made for an enjoyable evening as the lighted city of Cleveland, OH glowed nicely in the background. As per usual “Look What The Cat Dragged In” opened the show in customary fashion. The infrequent “I Want Action” and “Something To Believe In”, generally played at Poison headlining shows only this summer, got to see the light of day. 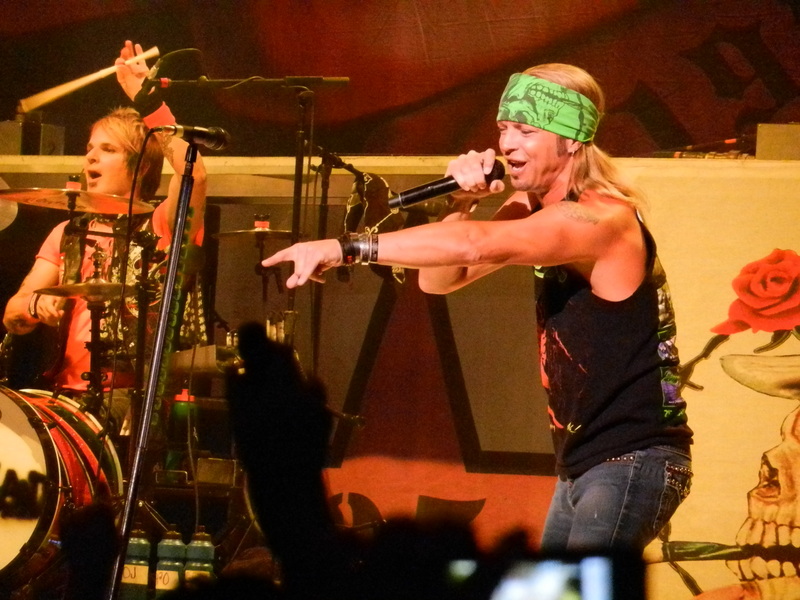 Singer Bret Michaels’ voice was a little rough in the beginning but by “Ride The Wind” his vocals seemed smoothed out. Unlike Bret’s harmonica that was extremely loud and ear piercing during the overindulged “Your Mama Don’t Dance”. If there was one song in the set that needed to be given a rest, Mama wins hands down. Sure the crowd expects to hear it, however so many of Poison’s gems have to be left out of the set. Known for their typical set lists the past seven years, from the predictability aspect they may as well just sell t-shirts with the songs printed on the back. Being the 25th anniversary, it would have been nice to dust of “Cry Tough”, a song last played on the 2006 tour that was added mid-tour to an overwhelming response. Coincidently it was here in Cleveland at the Blossom Music Center where the song was added for the first time on the 06′ tour. Other songs lost in the shuffle such as “I Won’t Forget You”, “Love On The Rocks”, “Let It Play” and “So Tell Me Why” would really brighten up a set list that needs reconstructive surgery. Don’t get me wrong, the performance was one of the best the band has put on in recent tours. The band was full of energy and has been recently given Mötley Crüe a run for their money on the main tour. After talking to drummer Rikki Rockett afterwards he confirmed that sometimes it takes time to get into a playing groove. Poison had not toured since 2009 prior to this tour. The band does seem to be hitting on all cylinders at the moment. But one has to realize that their faithful are shrinking when they used to play to a fuller house at the much bigger aforementioned Blossom Music Center down the road in Cuyahoga Falls. Time to give the people what they want. Perhaps the band needs to follow other band’s lead and play 1986‘s Look What The Cat Dragged In album in its entirety. Perhaps then people won’t feel they are getting a carbon copy show night after night. Opening the show Warrant, with original line-up minus ex-singer Jani Lane in tow. The failed re-union with Lane a few years ago set these guys back a bit. But they may have found their guy in Robert Mason, who has stepped in and done an incredible job on vocals. This marked the first time I got the chance to see him with Warrant and the band seems happy and at peace. They are pulling songs from the archives with regularity. “Sure Feels Good To Me”, a great choice by the way, opened the show. “Mr. Rainmaker” and “So Damn Pretty” were welcome additions to a solid set. Catch these guys if you get the opportunity.